Understanding the potential impacts of climate and land cover change at continental to global scales with a sufficient resolution for community scale planning and management (e.g., ecological services, water supply, flood risk) requires improved representation of the hydrologic cycle (e.g., surface/subsurface runoff generation, lateral runoff transport, lake/wetland water balance, and river transport/inundation) and scale (finer in both space and time) than is possible based on existing measurement networks and Earth system models (Gleick et al., 2013; Wood et al., 2011). The global uniformity and space/time resolution of the proposed Surface Water and Ocean Topography (SWOT) measurements (Rodríguez, 2015) will enable hydrologic discovery, model advancements and new applications addressing the above challenges that are not currently possible or likely even conceivable. Integrate lateral inflows into a SWOT discharge algorithm. Integrate lake/reservoir dynamics into a SWOT discharge algorithm. Develop a SWOT modeling Application for community scale flood hazard/risk assessment in collaboration with FM Global. How does lateral inflow to SWOT river reaches vary with basin scale, climate setting or season? For example, what is the fraction of lateral inflow compared to reach-ave. flow? 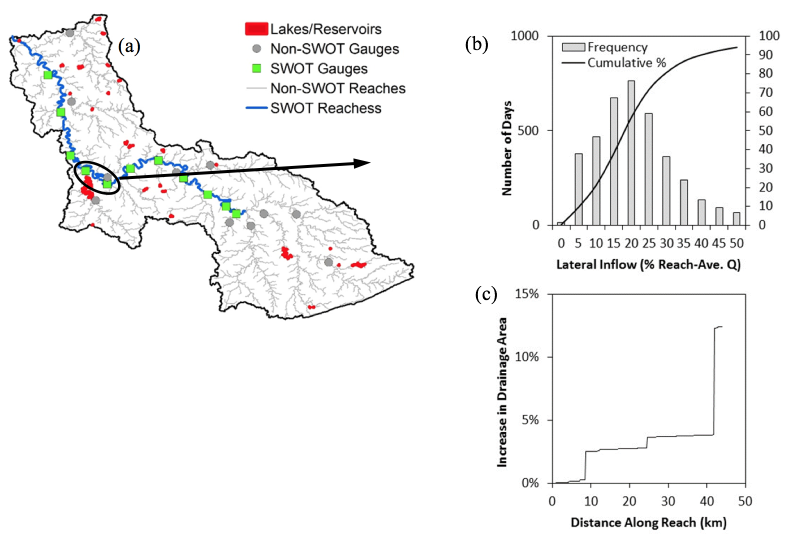 How does the distribution of SWOT observable lakes/reservoirs along observable and non-observable rivers impact lateral inflow to SWOT observable river reaches? What fraction of SWOT rivers are impacted by reservoir regulation? How will SWOT measurements and derived products developed over the mission lifetime (1- to 3-yrs) improve our ability to forecast hydrologic stores and fluxes for future climate conditions or extreme events? Figure 1 provides an overview of the proposed project, where objectives 1, 2 and 3 are highlighted by red, blue and green arrows, respectively. For objectives 1-2, we will model discharge from rivers NOT observable by SWOT (see Figure 2) to improve discharge algorithm performance. For Objective 3, we will simulate discharge in ALL rivers. Figure 1. Proposed research plan: (red) Hillslope River Routing (HRR) model (Beighley et al., 2009) provides lateral inflow to the MetroMan discharge algorithm (Durand et al., 2014), (blue) SWOT provides lake/reservoir storage patterns to HRR model, and (green) 3-yrs of SWOT discharge used to calibrate model for use in a Flood Hazard/Risk Application in collaboration with FM Global. Figure 2. Key proposal concepts: (squares) reservoir outlow to observable SWOT rivers, (circles) reservoir outflow to rivers not observable by SWOT, and (arrows) lateral inflow from upland areas and streams not observable by SWOT. where Q is river discharge, n is the roughness coefficient, A0 is the cross-sectional area corresponding to the first SWOT overpass, δA is the change in cross-sectional area since the first overpass, W is river top width, and S is the water surface slope. Note that δA can be calculated from water surface elevation (H) and W observations, as described in Durand et al. (2014). Figure 3. Discharge estimated on Severn River for 3 different assumptions about laterial inflows: (a) assuming they are known; (b) assuming they are unknown; (c) assuming they are unknown, but for a single reach have a known A0. Thus, δA, W, and S are calculated from SWOT observables, whereas n and A0 are not observable; all quantities represent reach-averages, where reaches are to be ~10 km in length. Durand et al. (2014) demonstrated the MetroMan on the River Severn using water elevation measured at three gauges, and cross-sectional area from field-measurements of river cross-section. Several experiments with different assumptions regarding lateral inflows led to relative RMSE ranging from 10% to 36%, as shown in Fig. 3. When the lateral inflows were known perfectly, the discharge was estimated to 10% RMSE (Fig. 3a). 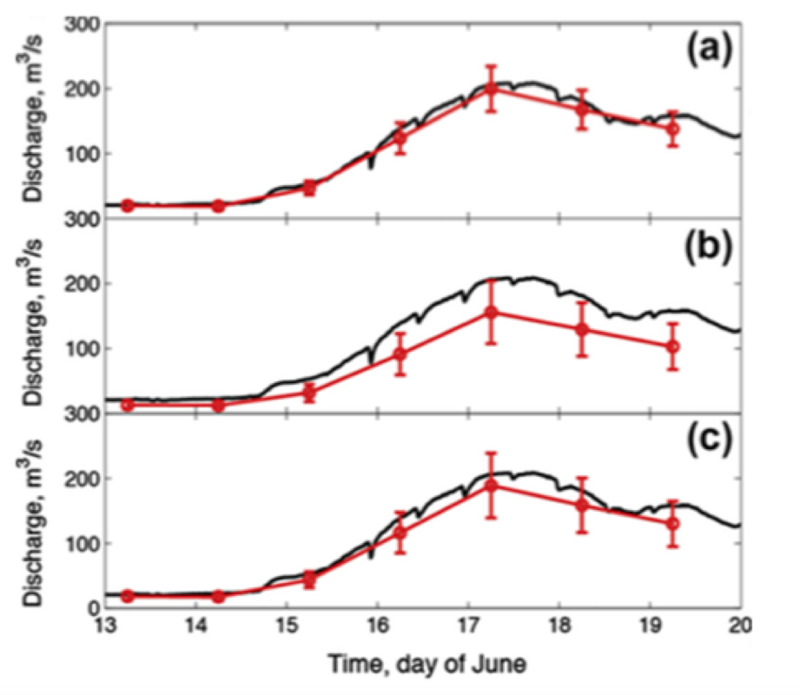 However, when an estimate of the lateral inflows was provided from a highly simplified rainfall-runoff model, the discharge estimate was degraded significantly (Fig. 3b). To further illustrate the importance of lateral inflow, we highlight the Kentucky River Basin. Figure 4a shows the basin with rivers that will likely be measured by the SWOT mission (blue) as well as gauges along SWOT rivers and rivers to narrow to be observed by SWOT (gray). We also include lake and reservoir locations throughout the basin (to be discussed later). Comparing streamflow between two gauges (Fig. 4b) shows that lateral inflow represents more than 20% of reach-averaged discharge roughly 43% of the time (representing 30% of mean Q 20% of the time) with lateral inflow representing as much as 1.8 times reach-averaged discharge. It is also important to note that the lateral inflow contribution (e.g., 20% of Qmean 43% of the time) results from only a 13% increase in area (Fig. 4c) which is the result of three tributaries not observable with SWOT (i.e., vertical steps in Fig. 4c) and direct lateral drainage. Although the relative contribution of lateral inflow will tend to decrease moving downstream, so will the number of river reaches, suggesting lateral inflow will be appreciable in a large fraction of SWOT river reaches. Figure 4. (a) Kentucky River Basin with river reaches that will and will not be observable by SWOT with corresponding USGS streamflow gauge locations and lake/reservoirs measured by SRTM (likely to be measured by SWOT); (b) distribution of lateral inflows between USGS gauges 03286500 (13,000 km2) and 03284500 (11,400 km2) during 2010-2012, where the contribution from lateral inflow is determined by: Qup – Qdown/Qmean; and (c) the increase in cumulate drainage area along the river reach from the upstream gauge (03284500) to the downstream gauge (03286500). One of the key challenges to quantifying the global hydrologic cycle or even lateral inflows to SWOT river reaches is lake/reservoir attenuation and regulation. For example, Figure 5 shows our characteristic storage pattern developed for Cordull Hull Lake in the Cumberland River Basin upstream of Nashville, TN, based on synthetic SWOT measurements as used in the Hillslope River Routing (HRR) model (Yoon and Beighley, 2015; Yoon et al., 2016). Figure 5a shows 10-yrs of weekly cumulative storage change measurements (Fig. 5b is normalized version) sorted by Julian day where the reservoir fills in ~30-days (day 90 to 120) and drains over ~60-days (day 270 to 330). This pattern, which will be observable by SWOT, is almost completely independent of inflow or lake level, but rather regulated by a combination of flood control, navigation, hydropower and recreation. Using our approach (Yoon and Beighley, 2015), Figure 5c shows simulated reservoir outflow compared to in-situ data. Figure 5. (1) 10-yrs (2000-2009) of cumulative synthetic SWOT storage changes sorted by Julian day for Cordull Hull Lake in the Cumberland River Basin upstream of Nashville, TN; (b) normalized characteristic storage pattern developed by synthetic SWOT measurements and used in HRR to simulate storage and outflow dynamics and (c) simulated reservoir outflow (dark blue) compared to in-situ measurments (light blue) for a large flood event in May 2001. Figure 6. 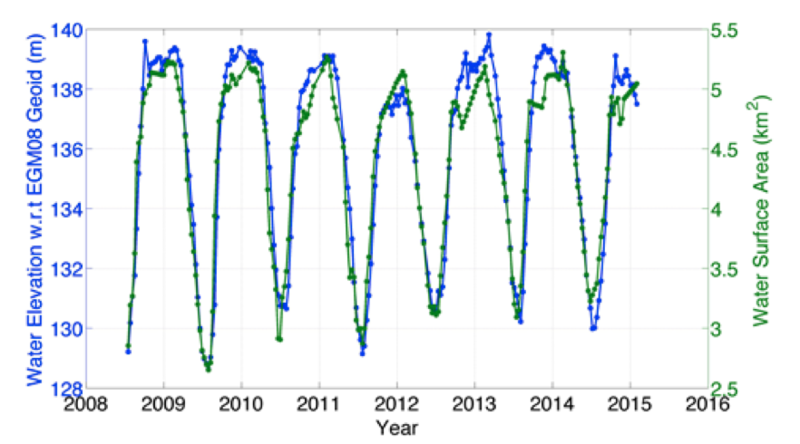 Time series of water elevation over the Kainjii Reservoir, Nigeria, from Jason-2 (blue) and surface area from MODIS (green). To develop the required input for our characteristics storage patterns, requires time series of lake/reservoir storage changes (i.e., volume = change in water height x change in surface area). Figure 6 shows the time series of water level changes and surface area changes over the Kainji Reservoir in Nigeria. It can be seen that the water elevation change from Jason-2 and surface area changes from MODIS NDVI (using threshold method) agree (R2=0.92). Although not show, we also find that Jason-2 and AltiKa derived water elevations match very well. We will use altimetry-derived water elevation changes and LandSat and MODIS NDVI derived surface areas changes to estimate storage changes over those lakes and reservoirs that have altimetry overpasses. Beighley, R.E., K.G. Eggert, T. Dunne, Y. He, V. Gummadi, and K.L. Verdin (2009), Simulating hydrologic and hydraulic processes throughout the Amazon River Basin, Hydrological Processes, 23(8), 1221-1235. Durand, M., J. Neal, E. Rodriguez, K.M. Andreadis, L.C. Smith, and Y. Yoon (2014), Estimating reach-averaged discharge for the River Severn from measurements of river water surface elevation and slope, Journal of Hydrology, 511, 92-104. Gleick, P.H., H. Cooley, J.S. Famiglietti, et al., (2013), Improving Understanding of the Global Hydrologic Cycle, in Climate Science for Serving Society, edited by G. R. Asrar and J. W. Hurrell, pp. 151-184, Springer Netherlands. Rodríguez, E. (2015), Surface Water and Ocean Topography Mission (SWOT) Project, Science Requirements Document, NASA Jet Propulsion Laboratory, JPL D-61923, 1-27. Wood, E.F., J.K. Roundy, T.J. Troy, et al., (2011), Hyperresolution global land surface modeling: Meeting a grand challenge for monitoring Earth's terrestrial water, Water Resources Research, 47(5), W05301. Yoon, Y., and R.E. 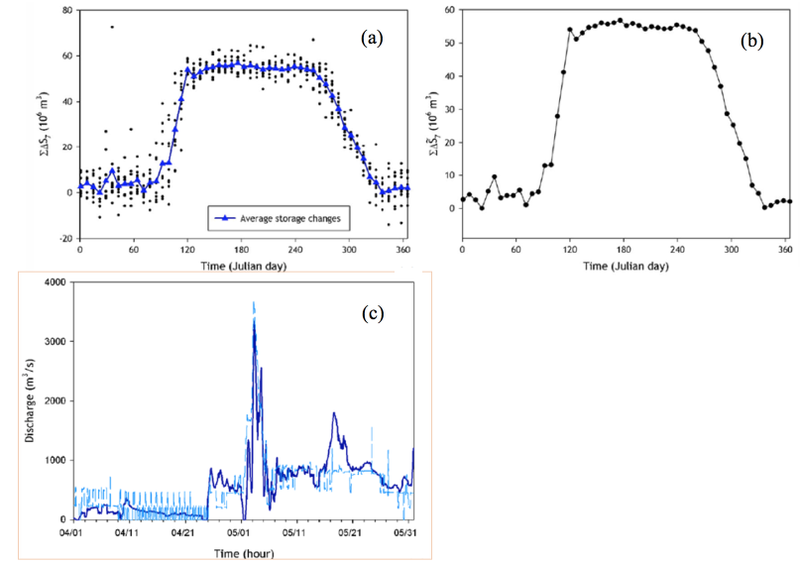 Beighley (2015), Simulating streamflow on regulated rivers using characteristic reservoir storage patterns derived from synthetic remote sensing data, Hydrological Processes, 29, 2014-2026. Yoon, Y., Beighley, R.E., Lee, H., Pavelsky, T.M., & Allen, G.H. (2016). Estimating Flood Discharges in Reservoir-Regulated River Basins by Integrating Synthetic SWOT Satellite Observations and Hydrologic Modeling, Journal of Hydrologic Engineering, 21, 05015030.